L’objectif de ce groupe de recherche est de créer de nouvelles molécules organo-­phosphorées et sulfurées d’une part, en vue d’étudier leurs applications comme intermédiaires de synthèse sélectifs notamment en synthèse asymétrique et organométallique et, d’autre part, pour leurs activités potentielles dans le domaine du médicament, de l’agrochimie ou des matériaux. 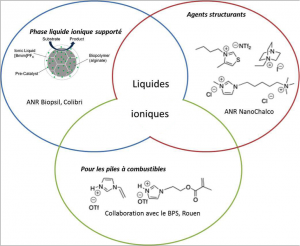 Un autre aspect de ce groupe est la synthèse à façon de liquides ioniques pour des applications variées. A multinuclear NMR study shows that the deprotonation of diphenylphosphine-borane by n-BuLi in THF leads to a disolvated lithium phosphido-borane Ph2P(BH3)Li of which Li+ is connected to the hydrides on the boron and two THF molecules rather than to the phosphorus. This entity behaves as both a phosphination and a reducing agent, depending on the kinetic or thermodynamic control imposed to the reaction medium. Density functional theory computations show that H2P(BH3)Li exhibits a ditopic character (the lithium cation can be in the vicinity of the hydride or of the phosphorus). It explains its dual reactivity (H- or P-addition), both routes going through somewhat similar six-membered transition states with low activation barriers. 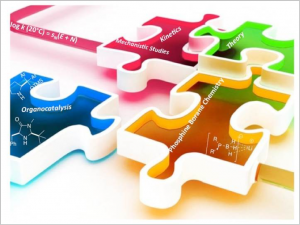 – Phosphine catalysis and aminocatalysis. Castelli, U.; Lohier, J.-F.; Drukenmüller, I.; Mingot, A.; Bachman, C.; Alayrac, C.; Marrot, J.; Stierstorfer, K.; Kornath, A.;Gaumont, A.-C.; Thibaudeau, S.
Angewandte Chemie, Inter. Ed, 2019, 1369-1374. Glachet, T.; Franck, X.; Reboul, V.
Chaabouni, S.; Lohier, J.-F.; Barthelemey, A.-L.; Glachet, T.; Anselmi, E.; Dagousset, G.; Diter, P.; Pégot, B.; Magnier, E.; Reboul, V.
Synthetic Methods, 2018, 24 (64), 17006-17010. Sulfinate-organocatalyzed (3+2) annulation of allenyl sulfones with 1,1-dicyano olefins in the presence of a quaternary ammonium phase transfer agent. Martzel, T.; Lohier, J.-F.; Gaumont, A.-C.; Brière, J.-F.; Perrio, S.
Adv. Synth. Catal., 2018, 360, 2696–2706. Harrison-Marchand, A.; Guang, J.; Duwald, R.; Maddaluno, J.; Oulyadi, H.; Lakhdar, S.; Gaumont, A.-C.
Chem. Eur. J. 2018, 24(26), 6717-6721. Cadart, T.; Levacher, V.; Perrio, S.; Brière,J.-F.
Adv. Synth. Catal., 2018, 360, 1499–1509. Vittoz, P. F.; El Siblani, H.; Bruma, A.; Rigaud, B.; Sauvage, X.; Fernandez, C.; Vicente, A.; Barrier, N.; Malo, S.; Levillain, J.; Gaumont, A.-C.; Dez, I.
ACS, Sustainable Chemistry & Engineering 2018, 6, 5192-5197. Ahmad, M.; Gaumont, A.-C.; Durandetti, M.; Maddaluno, J.
Angew. Chem. Inter. Ed. 2017, 56 (9), 2464-2468. Dupré, J.; Gaumont, A.-C.; Lakhdar, S.
Org. Lett. 2017, 19(3), 694-697. Rousée, K.; Pannecoucke,X. ; Gaumont,A.-C.; Lohier,J.-F.; Morlet-Savary,F. ; Lalevée, J.; Bouillon,J.-P.; Couve-Bonnaire, S.; Lakhdar, S.
Marzag, H.; Schuler, M.; Tatibouët, A.; Reboul, V.
Eur. J. Org. Chem. 2017, 896-900. Lohier, J.-F.; Glachet, T.; Marzag, H.; Gaumont, A.-C.; Reboul, V.
Chem. Commun. 2017, 53, 2064-7. Adv. Synth. Catal. 2017, 356(1), 96-106. Fausti, G.; Morlet-Savary, F.; Lalevée, J.; Gaumont, A.-C.; Lakhdar, S.
Chem. Eur. J. 2017, 23, 1-6. Cadart, T.; Berthonneau, C.; Levacher, V.; Perrio, S.; Brière, J.-F.
Chem. Eur. J. 2016, 22, 15261-15264. Noël-Duchesneau, L.; Lagadic, E.; Morlet-Savary, F.; Lohier, J.-F.; Chataigner, I.; Breugst, M.; Lalevée, J.; Gaumont, A.-C.; Lakhdar, S.
Org. Lett. 2016, 18, 5900-5903. Highlighted in Synfacts : Synthesis of 6-Phosphorylated Phenanthridines, 2017, 13, 140. Quint, V.; Morlet-Savary, F.; Lohier, J.-F.; Lalevée, J.; Gaumont, A.-C.; Lakhdar, S.
J. Am. Chem. Soc. 2016, 138, 7436-7441. Highlighted in Synfacts, 2016, 12, 862. Guerin, D.; Dez, I.; Gaumont, A. C.; Pannecoucke, X.; Couve-Bonnaire, S.
Org. Lett., 2016, 18 (15), 3606-3609. Bulman, P. C.; Richard, S. G.; Harvey, J.; Gaumont, A.-C.; Alayrac, C.; Slawin, A. M. Z.
Synlett, 2016, 27 (6), 961-964. Vincent, A.; Deschamps, D.; Martzel, T.; Lohier, J.-F.; Richards, C. J.; Gaumont, A.-C.; Perrio, S.
J. Org. Chem., 2016, 81(9), 3961-3966. Gerard, P.; Veillard, R.; Alayrac, C.; Gaumont A.-C.; Evano, G.
Eur. J. Org. Chem. 2016, 633-638. Gelat, F.; Lohier, J.-F.; Gaumont A.-C.; Perrio, S.
Adv. Synth. Catal., 2015, 357, 2011-2016. Peudru, F.; Lohier, J.-F.; Gulea, M.; Reboul, V.
Phosphorus, Sulfur, and Silicon and the Related Elements, 2015, 191, 220-229. Clousier, N.; Filippi, A.; Borré, E.; Guibal, E.; Crévisy, C.; Caijo, F.; Mauduit, M.; Dez, I.; Gaumont, A.-C.
Chem. Sus. Chem. 2014, 7(4), 1040-1045. Mouawia, A.; Nourry, A.; Gaumont, A.-C.; Pilard J.-F.; Isabelle Dez, I.
L’actualité chimique 2014 – n° 390- p.88-89. Mathiaud, R.; Courtheoux, L.; Silly, G.; Albadri, H.; Levillain, J.; Gaumont A.-C.; Ribes, M.; Pradel, A.
European Journal of Inorganic Chemistry 2014, 6232-6238. Veillard, R.; Bernoud, E.; Abdellah, I.; Lohier, J.-F.; Alayrac, C.; Gaumont, A.-C.
Org. Biomol. Chem. 2014, 12, 3635-3640. Evano, G.; Jouvin, K.; Theunissen, C.; Guissart, C.; Laouiti, A.; Tresse, C.; Heimburger, J.; Bouhoute, Y.; Veillard, R.; Lecomte, M.; Nitelet, A.; Schweiser, S.; Blanchard, N.; Alayrac, C.; Gaumont, A.-C.
Chem. Commun. 2014, 50, (70), 10008-10018. In e-eros Electronic Encyclopedia of Reagents for Organic Synthesis, B. A. Charrette Ed. ;Wiley: 2014; pp 1-12. Ballester, J.; Gatignol, J.; Schmidt, G.; Alayrac, C.; Gaumont, A.-C.; Taillefer, M.
Guerin, D.; Gaumont, A.-C.; Dez, I.; Mauduit, M.; Couve-Bonnaire, S.; Pannecoucke, X.
ACS Catal., 2014, 4, 2374-2378. Gaumont, A.-C.; Gulea, M.; Perrio, S.; Reboul, V.
In Gary A. Molander and Paul Knochel (Eds), Comprehensive Organic Synthesis, 2nd Edition, Volume 8, Oxford: Elsevier; 2014, pp. 535-563. Evano, G.; Gaumont, A.-C.; Alayrac, C.; Wrona, E. I.; Giguere, J. R.; Delacroix, O.; Bayle, A.; Jouvin, K.; Gatignol, J.; Silvanus, A. J.
Peudru, F.; Le Cavelier, F.; Lohier, J.-F.; Gulea, M.; Reboul, V.
Org. Lett. 2013, 15, 5710-5713. Buttress, J. P.; Deschamps, D.; Lancelot, M.; Martin, J.-P.; Sheldon, A. I. G.; Alayrac, C.; Gaumont, A.-C.; Page, P. C. B.; Stephenson, G. R.
Gelat, F.; Gaumont, A.-C.; Perrio, S.
J. Sulfur Chem. 2013, 34, 596-605. Routaboul, L.; Toulgoat, F.; Gatignol, J.; Lohier, J.-F.; Norah, B.; Delacroix, O.; Alayrac, C.; Taillefer, M.; Gaumont A.-C.
Chem. Eur. J., 2013, 19, 8760-8764. Jouvin, K.; Veillard, R.; Theunissen, C.; Alayrac, C.; Gaumont, A.-C.; Evano, G.
Org. Lett. 2013, 15 (17), 4592-4595. Beqa, L.; Deschamps, D.; Perrio, S.; Gaumont, A.-C.; Knoppe, S. ; Bürgi, T.
J. Phys. Chem. C, 2013, 117, 21619-21625. Gatignol, J.; Alayrac, C.; Lohier, J.-F.; Ballester, J.; Taillefer, M.; Gaumont, A.-C.
Adv. Synth. Catal. 2013, 355, 2822-2826. Vincent, T.; Krys, P.; Jouannin, C.; Gaumont, A.-C.; Dez, I.; Guibal, E.
J. Organomet. Chem. 2013, 723, 90-97. J. Appl. Pol. Sci. 2013, 128 (5), 3122-3130. J. of Appl. Pol. Sci. 2012, 127 ( 5), 4015-4026. Nitrophenol hydrogenation using Pd immobilized on ionic liquid-alginate spherical resins. Separation Science and Technology 2012, 47, (14-15), 2166-2176. Study of alginate-supported ionic liquid and Pd catalysts. C. Jouannin, C. Vincent, I. Dez, A.-C.Gaumont, T. Vincent, E. Guibal, E.
Nanomaterials 2012, 2, (1), 31-53. Synthetic methodologies for the preparation of beta-aminothiols. Eur. J. Org. Chem. 2012, 5423-5434. Chem. Commun. 2012, 48, (34), 4088-4090. Synthesis of a [2.2] paracyclophane based planar chiral palladacycle by a highly selective kinetic resolution/C-H activation reaction. Chem. Commun. 2012, 48, 1991-1993. Tetrahedron Lett. 2011, 52, 6321-6324. Org. Lett. 2011, 13, 3170-3173. J. Am. Chem. Soc. 2011, 133, (16), 6472-6480. Tetrahedron Asymmetry 2011, 22, (5), 562-574. Bernoud, E.; Alayrac, C.; Delacroix, O.; Gaumont A.-C.
Chem. Commun. 2011, 47, 3239-3241. Appl. Cat. B: Environemental 2011, 103, (3-4), 444-452. D. Julienne, O. Delacroix, J.-F. Lohier, J. S. de Oliveira-Santos, A.-C. Gaumont, A.-C.
Eur. J. Inorg. Chem. 2011, 2011, (16), 2489-2498. N. Clousier, R. Moucel, P. Naik, J.-P. Madec, A.-C. Gaumont, I. Dez, I.
C. R. Chimie 2011, 14, (7-8), 680-684. Tetrahedron Lett. 2010, 51, 6014-6017. J. Med. Chem. 2010, 53, 4862-4876. Adv. Synth. Cat., 2010, 352, 433-439. Current Org. Chem., 2010, 14, 457-482. Heteroatom Chem., 2010, 21, 242-249. Current Org. Chem., 2010, 14, 1195-1222. Org. Biomol. Chem., 2010, 8, 2520-2521. CR Chim., 2010, 13 (8-9), 1099-1103. Carbohydrate Polymers, 2010, 82, 256-263. L’actualité chimique, 2010, 338-339, 15-27. First C-P cross-coupling reaction of vinyltosylates with diphenylphosphine-borane : new access to Vinylphopshine-borane derivatives. Tetrahedron : Asymmetry, 2009, 20, 293-297. Tetrahedron Lett., 2009, 50, 7239-7241. J. Sulfur Chem., 2009, 30, 338-345. J. Org. Chem. 2009, 74, 3936-3939. Org. Lett. 2009, 11, 2776-2779. Chem. Rev., 2009, 109 (3), pp 1371-1401. Chemical Reviews, 2008, 108 (12), 5035-5060. Tetrahedron Letters, 2008, 49, 6553-6555. Tetrahedron Letters, 2008, 49, 4329-4332. Amino Acids, 2008, 35, 175-184 (DOI 10.1007/s00726-007-057-3). Journal of Organometallic Chemistry, 2008, 693, 2499-2508. Tetrahedron Letters, 2007, 48, 351-355. Journal of Organic Chemistry, 2007, 72, 2247-2250. ACS Book Series, 2007, 19, 246-258. Green Chemistry, 2007, 9, 1346-1351.